Linda and I had the opportunity, recently, to visit the Legion of Honor in San Francisco’s Lincoln Park. Built to honor Californian soldiers who died in World War I, it houses a very impressive array of Auguste Rodin sculptures. One of them is The Prodigal Son featured on the cover of your bulletin this morning. Rodin has captured that moment in the story when the repentant prodigal falls to his knees before the Father confessing his unworthiness. He has captured what we often think the story is about. The prodigal, having run off to the far country in dissolute living, finally “came to himself,” it says. The prodigal, having squandered all his money and self-worth, has hit bottom. The prodigal, the ungrateful sinner, realizes his utter folly and seeks to come back home. The prodigal returns home in shame and repentance hoping to be forgiven. This is what we’ve been taught this parable is about. Confess you sins and you can be forgiven. That perspective is echoed in our psalm reading: “Finally I admitted my sin to you, and stopped hiding my guilt. I said, “I confess my rebellion, Adonai,” and you took away the guilt of my sin.” Confess and be healed; repent and be saved. 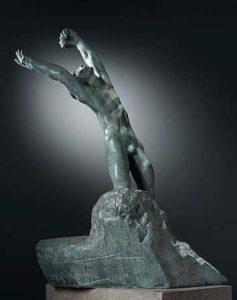 Fall to your knees in anguish and remorse, like Rodin’s prodigal, and you’ll forgiven. Then, and only then, can you experience the “happiness” the psalm speaks of. Count yourself among the redeemed! But I think we get it wrong. I think Rodin got it wrong. Do I dare say the psalmist got it wrong? Even the name of the story is wrong. This is not a story about a “prodigal son.” This is not a story about repentance, confession of sins, pleading for mercy. No, this is a story about a Father who wants nothing more than to have a party, a grand party. This is a party parable! Luke seems intent on driving this party theme home. In these chapters, Luke arranges several parables that are all about parties. There’s the parable of the Great Banquet in chapter 14. “Someone gave a great dinner and invited many,” it says. Then comes the parable of the Lost Sheep. He calls his friends and neighbors together and says, “Rejoice with me” – a party! The parable of the Lost Coin. She calls her friends and neighbors together and says, “Rejoice with me” – a party! The grand culmination comes in this parable of the prodigal. “And they began to celebrate,” it says – a grand party, indeed! In other words, this not a parable about confession and repentance and getting forgiveness. Oh, all of that is in there, all right. But that’s not the point. This is a parable about the overwhelming grace and mercy of a loving God, over and above and completely separate from any confessing we might bring to the party. That’s not to say there isn’t pain and suffering and angst and all kinds of other Lenten-type emotions we could consider. Indeed, not only is there all of that but there is even death. Oh, not literal death (well, maybe there is) but death nonetheless. The first death comes early on. We might miss it because we know it’s just the setup for the rest of the story. But it is a death nonetheless, even if just a metaphorical death. The younger son comes to the father. We don’t know what has prompted this move; there’s no explanation. But this son’s demand is more than just a request for money. In effect he is saying, “Father, I can’t wait for you to die; I want my inheritance now.” Simply put this demand really means “I wish you were dead.” It is a heartless rejection of the home in which the son was born and nurtured. It is a complete repudiation of his father. Oh, how it must have hurt. Oh, how deep the pain in the inner recesses of the father’s heart. Yet, the father goes along with his son. He gives him his portion in cash. Note also that it says that the father “divided his property between them.” Presumably the older son got his share as well, or maybe he got the farm. All this to say, for all intents and purposes (for the parable at least) the father is dead. Jesus, then, tells us what the younger son did with his load of cash: “He squandered his property in dissolute living.” Since it’s just a story we might be free to speculate on what that “dissolute living” looked like. Booze and drugs, prostitutes, maybe gambling casinos at $10,000 a night? Whatever the details, one morning the prodigal wakes up…dead. He finds himself sitting in pig sty having hired himself out to the indignity of slopping pigs. He’s even reduced to eating the pigs’ slop. In that deplorable setting, Jesus says that “he came to himself.” He realizes that whatever life he had is over. For all intents and purposes, he’s dead. That last phrase, “treat me like one of your hired hands,” shows that even though he has come face to face with death, he doesn’t really think he is dead. Maybe there’s a way out. Maybe I could come up with an angle to stay alive. True, he surmises, he can’t claim sonship anymore but, maybe just maybe, he can fake out a quasi-life for himself, as a hired servant. In short, because he can’t admit that he is completely out of business, he puts himself back in business – the bookkeeping business. Now, bookkeeping is a most honorable and needed profession, so nothing here to disparage our church treasurer. But for the ‘dead’ it is a meaningless exercise. So, the prodigal figures out a trial balance, using figures he’s made up, prepares a trumped-up spreadsheet, and decides that maybe he can finagle something. Can’t claim to be a son anymore, but a hired-hand…ah, now there’s a possibility. Maybe the old man is senile enough to make a deal. In a sense this second death, the prodigal’s death, occurs way off in the far country. But in the story, it doesn’t really occur until he gets home. In between he is just a zombie trudging home rehearsing his spiel in his head, hoping against hope that his father might buy it and that he’s really not dead. So, there’s the zombie trudging up the road to his father’s farm, apprehensive and scared. He can barely make out the house on the far horizon. But as he squints in the sun he sees a figure on the road, and he’s running towards him! Can it be? Yes, it is his father running with open arms. As he gets closer he can see the tears of compassion in his father’s eyes. And before he can say a word, his father grabs him, hugs him for dear life, and smothers him with kisses. Did you notice that? “Before he can say a word!” With his father draped around his neck, the son manages to blurt out some words. It isn’t even what he had planned to say. Just, I’ve sinned against you and “am no long worthy to be called your son.” The whole “I’ll be your servant” thing is forgotten in the drama of the moment. There, embraced in his father’s arms, stands, not a “I’m going to cheat death by scheming an alternate path to life,” but a dead son…A dead son who has been resurrected in his father’s arms. “This son of mine was dead and is alive again,” says the father. Resurrection! As far as the father is concerned, the son’s confession is meaningless. Nothing more need be said. He has already welcomed him home. Therein lies the whole point of the parable. We are already home. That is the theological truth Jesus is trying to get across. This story of death and resurrection is the story about grace. No confessional calculating earns us any points. No religious maneuvering gets us gets in closer. All confession is subsequent to forgiveness. In the context of this grace-filled parable we can see that confession has nothing to do with getting ourselves forgiven. Confession is not a transaction, not a negotiation in order to secure forgiveness. The role of confession in our lives is only to wake ourselves up to what we already have. Forgiveness resurrects us from the dead notion that we have what it takes to get into God’s graces by our own efforts. It abuses us of the notion that, as an old friend use to tell me, “if God grades on the curve, I think I’ll make it.” We can’t earn it because we already have it! Let me say it this way. We are forgiven before, during, and after our sins. We are forgiven before, during, and after our confession of them. Think about our Reformed theology of baptism. In our practice of infant baptism, babies do absolutely nothing to earn, accept, or believe in forgiveness; the church, in baptizing them, simply declares that they have it. We are not forgiven, therefore, because we made ourselves forgivable or even because we had faith; we are forgiven solely because there is a Forgiver. Which brings us, finally, to the party! The father puts no intermediary steps between the full embrace of his son and the celebration. There’s no, “well, son, your forgiven, now let’s see some good behavior to make the deal stick.” Instead, he turns to his servants and bent on nothing but the party, he commands the festivities to begin. After all, this is what the father wanted all along – a grand party! “Quickly,” he says, “bring out a robe—the best one—and put it on him; put a ring on his finger and sandals on his feet. And get the fatted calf and kill it, and let us eat and celebrate; for this son of mine was dead and is alive again; he was lost and is found!” And they party on. And here we encounter the third death of the parable – this one literal: they kill the fatted calf. Some have suggested that the fatted calf is actually the ‘Christ figure’ of the parable. The calf dies so they can have a party. Christ, “the Lamb slain from the foundation of the world,” as the book of Revelation puts it, dies so we might be raised from the dead. Jesus as the fatted calf? Could be! So, to sum up the parable thus far, it is be nothing but incredibly good news. The father, the prodigal, and the fatted calf are all dead and all three have been resurrected (the calf, admittedly, as a veal roast) and everyone is having a ball. As Jesus put it succinctly, “They began to make merry.” The end. Oh, you say, the story doesn’t end there? Yes, unfortunately there is a downer to the whole thing – the older son’s grumbling about the whole affair. Lots of griping; lots of righteous indignation; lots of un-grace. I could do a whole sermon on the older son but not today. We’ll just have to leave him stewing, trying to figure out how he can play his superior morality into a right standing with his father. But the father will have nothing of it because he’s enjoying the party – the party of forgiveness and grace and resurrection that all of us can enjoy if we just go for it. Party on, dude! Amen.